Where none will sweat but for promotion"
Followers of fashion have been accused of just being copy-cats; the expression 'fashion slave' has come to mean someone trapped by a need to conform to prevailing trends. Fashion has long played a part in breed-fancying with this not always being good for the dogs, whether it is the price paid by over-popularity, the introduction of an uncharacteristic anatomical feature conflicting with a breed's classic model or the seeking of perfection of form adversely affecting temperament and character. The quick rewards from puppy-farming the latest breed to feature in a TV ad appeal to the wallet-conscious if not to the rescue organisations. Gentler fashions are just about harmless - the American fashion of tying a coloured neckerchief around a dog's neck may give way next year to tartan waistcoats. The shaved throat of today's English Setter and Afghan Hound may give way next year to the favouring of a particular coat marking. The fashion for foreign breeds may one day give way to one promoting our native breeds. But there is one matter much more disturbing than fashion - fads! In 1990, the respected reputable American magazine The Atlantic Monthly published a report into 'how greed and AKC policies are endangering the health and quality of American dogs'. It was angrily dismissed by US dog breeders but its findings were never faulted. One particularly hard-hitting conclusion read: "For many faddists, the dog has become little more than equipment for a game. They justify the game in the name of freedom, arguing that no organisation or government body has the right even to recommend changes in their approach, despite its destructiveness, and the AKC has endorsed their ideology through word and policy." Fads can alter dogs' heads, their coats, their backs, their weight, their height as well as their anatomy as a whole. Faddists have no respect for function, a breed's origin or its health. One of the more worrying aspects for me of fashions in the dog world is the increasing preference for style over substance: the exhibit strung up on a tightly held noose, coats given a higher priority than the dog's comfort and the seeking of both stance and movement in the ring designed for flashiness rather than soundness. Some individual dogs seem to respond to the glamour of the show ring. We all love to see a handsome dog simply flowing round the ring, moving with obvious soundness and in the appropriate manner for the breed. But it is becoming slowly but surely all too rare. Fashions are beginning to dictate. These are fashions that suit humans not dogs and need scrutiny. The anatomy of a breed should decide the head posture of an exhibit being stacked and moved around the ring, not the handler's personal style or the current fashion. There are reasons why breeds carry their heads in a preferred natural way. Spaniels at work seek ground scent; pointers and setters seek air scent. Scenthounds seek ground scent; sighthounds seek distant movement. Terriers tend to seek movement just before them and par force hounds like Great Danes and Rhodesian Ridgebacks use their eyes ahead of their noses and seem to favour the high head. 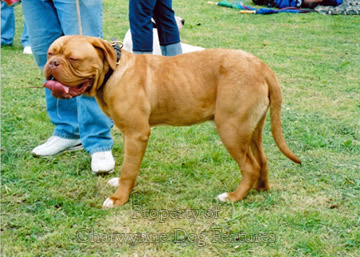 Holding dogs or catch-dogs like the Bullmastiff and the Dogue de Bordeaux however are just not built for high-headed movement. Powerful dogs once required to seize and hold big game needed immensely strong heads, most of their weight on the forehand and the ability to 'go in' head down and with great dash and power. 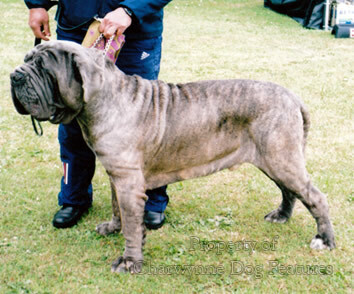 Breeds like the Bullmastiff, the Dogue de Bordeaux and the Neapolitan Mastiff should therefore be allowed to stand and move without their quite heavy heads being yanked up on a noose-cord or choke-chain. When judging the Best-in-Show class at the first national show of the Victorian Bulldog Society, I asked the handlers to slacken their leads so that the entry could stand and move as naturally as possible. I find it difficult to judge the front action of a strong-headed breed when it is being made to carry its head unnaturally. In his valuable book, The Conformation of the Dog (Popular Dogs, 1957), RH Smythe wrote: "One cannot expect the same type of movement to exist in animals as dissimilar as a Greyhound and a Setter, nor can one compare the action of an Alsatian (sic) with that of a Miniature Poodle. Some breeds possess a characteristic lope, some are expected to show a rolling gait, some waddle, while others exhibit a mincing, high-stepping action, some march sedately, others waggle their sterns. Action is therefore a breed characteristic...a judge is expected to know not only if a dog is sound but also if it exhibits the style of gait or action which the standard of the breed or the fashion of the day demands..." It is that latter phrase which bothers me: the fashion of the day. Three hundred years ago, Samuel Wesley wrote that 'style is the dress of thought'. I do hope that thought is behind the style in which some breeds are contemporarily being asked to stand and move. 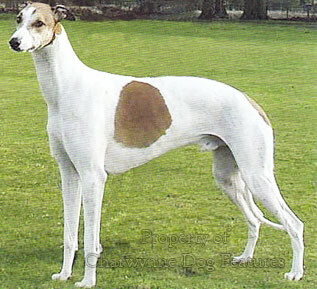 A combination of the dog being strung by its noose-cord, the straight front end (in profile) now being desired in so many breeds and the short-stepping style becoming prevalent in the smaller breeds is simply not conducive to the production of sound dogs. The seeking of a statuesque dog may not be in the best interests of the production of a sounder dog. Some more knowledgeable championship show judges pick up on this menace: Bernese Mountain Dogs: "For some years now we have experienced straight forequarters and a lack of extension on the move"; Afghan Hounds: "I have never seen so many straight upper arms"; English Setters: "One worrying observation is poor forehands with upright shoulders and short straight upper arms"; Schnauzers: "Some front assembly problems are bringing an incorrect high stepping stiff front action" and Salukis: "...straight upper arms are creeping in..."
This makes sad reading. These are essentially functional breeds. Any Saluki fancier seeking to discover why straight upper arms are a handicap to a sighthound should view Sir Terence Clark's video 'The Eastern Saluqi'. There you can see hunting dogs with a forward extension to gladden your heart. But so many breed fanciers nowadays seem to be seeking dogs with a straight line from the throat to the toes in the forehand profile. However fashionable, such a feature can only mean a choppy front action, very restricted forward reach and therefore little stride. Short-stepping in front has become very much the fashion in terriers and Toy breeds. Some regard it as stylish; to me it's a disaster. 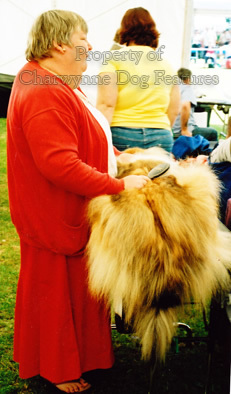 So too in time will be the fashion for needlessly heavy coats on admirable working breeds like the Beardie, the Rough Collie, the Shetland Sheepdog and the Bobtail, important native breeds. 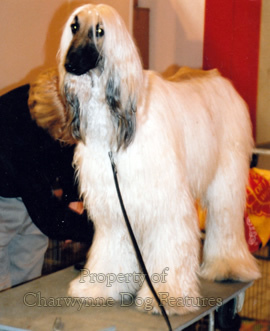 Hungarian breeds like the Puli and the Komondor seem to be able to cope with heavy coats - which may be natural to them. But British breeds haven't always had such heavy coats. The Collie is susceptible to all the dermatoses which affect the modern dog. The Beardie is still a working dog in some places but the latter does not feature the heavy coats now apparently de rigueur in the show ring. 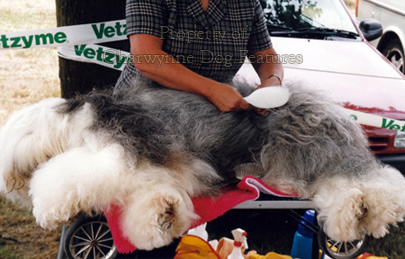 On all the collie breeds, the coat should 'fit well', still allow the outline to be discerned. When style is mentioned in connection with dogs, I immediately think of setters and pointers. But if you look at old prints and paintings of our native bird dogs, they depict dogs far more substantial than the current fashion. Setters and Pointers as depicted in the last two centuries display far more muscle than today's show ring dogs without looking at all cloddy. The skill of the pedigree dog breeder is to produce quality and uniformity without losing type. When that type itself falls victim to fashion or the style of the decade, it becomes, for me, a matter of man exploiting dog and not always for dog's benefit. 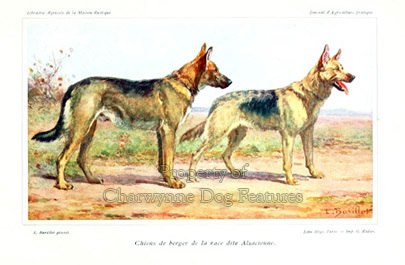 When I first worked in Germany, fifty years ago, two of their native breeds, the Boxer and the Schaeferhund or Alsatian, were markedly different from the type favoured in contemporary show rings. A local car dealer used Boxers as guard dogs; they were solid black and strongly muscled. Today's Boxers seem half their weight and appear only favoured when carrying the 'Irish' markings: white feet, blaze and brisket. The German Shepherd Dogs I encountered on remote farms in Westphalia were like those I had used in the Malayan emergency: with a level top line, well-boned and only moderately angulated in the hindquarters. At World Dog Shows I see GSDs with dreadful bent backs, their hindquarters so exaggerated that the dog has to rest its whole rear pastern on the ground for comfort and with tails so long they drag along the surface of the ground. It's difficult to make sense of this. It has become fashionable to favour English Toy Terriers more like Chihuahuas than their own ancestors, if old paintings are at all representative. 81 Black and Tan Terriers were registered with the Kennel Club in 1908, in the Toy Division; in 1998 only half that number were registered as English Toy Terriers (Black and Tan). Human whim is difficult to check but it would be sad to see this old native breed unwanted by the public. In Toy Dogs, written and published by Lillian Raymond-Mallock early in the last century, she writes: "There has been a gradual falling off in the good old toy black and tan terrier in recent years...In this variety possibly more than others, the apple head and goggle eyes are too much in evidence...They should be counterparts of the Manchester terrier, any approach to the Italian Greyhound type being most objectionable." She wouldn't have liked today's fashion. At times in the pedigree dog world there is a distinct impression given that style and fashion are more important to some than breed type and breed characteristics. Yet fifty years ago, in his informative book, 'The Practical Guide to Showing Dogs' (Popular Dogs, 1956), Capt R Portman-Graham emphasised the need for each breed to be shown differently: "The aim of the handler is to manoeuvre his dog in the way most likely to display the special characteristics and points of its breed, and to bring out the temperament which is expected from that breed." He would not have approved the strange desire for a sheepdog to have to demonstrate 'gaiting' at great speed! Portman-Graham went on to condemn the odious too-tight a lead fashion, writing: "To strangle a terrier in a tight noose, and dangle it with its feet scarcely touching the ground in the attitude of a marionette, is not good handling." Neither is it good judging to allow it. How can any judge possibly assess movement when a tight lead is preventing proper contact between a dog's feet and the ground? It encourages faking. But it is happening in more and more breeds and is being condoned by more and more judges. To see any dog show judge pretending to judge the movement of exhibits strung up on a tight lead is a sad commentary on the competence of that judge. It would be a huge advance if the Kennel Club were to decree that every breed must move on a slack lead and be hardly held on the lead when stacked. Exhibiting dogs can be a rewarding pastime, but the fashions involved should not provide an arena for self-promotion, as my opening quote from Shakespeare hinted. Dogs should not be discomforted in the ring and breed characteristics should be valued and exemplified not subsumed into a common practice. The show ring has one huge huge disadvantage, whatever the ruling fashion: it cannot reveal the dog's capability. We must be vigilant if we are not to lose character, determination, working prowess, instinctive behaviour, individuality, courage, intelligence and fortitude. A handsome dog without character has cosmetic appeal and is likely to win in the show ring but for me it has no breeding potential. I would place character ahead of any other virtues. The genes for character and determination are those which provided us with the breeding stock from which we now plan to produce perfection of form. Breeds of dog are now fashioned by show criteria but we would be more than stupid if we bred solely for looks. The working dog fraternity might claim that that what's been happening for a century in the show dog world, a world in which a dog that can do nothing can still have high value. Not being an exhibitor I can choose my next pup on how I think its character might develop. But I must admit that I hope the pup I choose will become a handsome adult. Those purebred dog breeders who rely on the pet market for valuable income value the appeal of the pup, they need characters. Fashions come and go but memorable dogs are with us forever.